A SpaceX Dragon capsule is seen just after being released by the International Space Station's robotic arm on March 19, 2017 as capsule begins the trip back to Earth. The Dragon capsule delivered 5,500 lbs. of supplies to the space station and was returning 5,400 lbs. of science and gear. A SpaceX Dragon spacecraft splashed down in the Pacific Ocean Sunday (March 19), returning to Earth with more than 2 tons of science experiments and other gear from the International Space Station. The robotic Dragon cargo ship splashed down off the coast of Baja California where it could be swiftly retrieved by a recovery team. The space capsule left the station early Sunday after being released by astronauts Thomas Pesquet (of France) and Shane Kimbrough (of NASA) using a robotic arm. 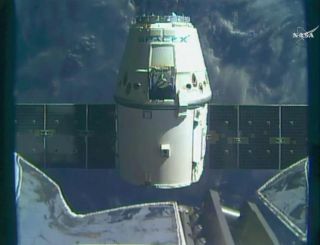 SpaceX representatives reported a good splashdown of Dragon at at about 10:48 a.m. EDT (1448 GMT) in a Twitter post. "Today we said goodbye to Dragon," Pesquet, a European Space Agency astronaut, wrote in a Twitter post. "She is taking part of us back to the ground with her — important scientific samples, some from the crew!" The Dragon cargo ship launched Feb.19 atop a SpaceX Falcon 9 rocket. It delivered 5,500 lbs. (2,500 kilograms) of science gear and supplies, and marked SpaceX's first launch from NASA's historic Pad 39A at the Kennedy Space Center in Florida. Unlike the disposable cargo ships that service the space station — like Russia's Progress vehicles, Orbital ATK's Cygnus craft and Japan's HTV-2 vehicles —SpaceX's Dragon capsules are equipped with a heat shield that allow cargo to be shipped back to Earth, a boon for scientists. On this flight, Dragon returned to Earth with about 5,400 lbs. (2,450 kilograms) of space station gear. "Everything from stem cells that could help us understand how human cancers start and spread after being exposed to near zero-gravity, to equipment that is paving the way toward servicing and refueling satellites while they’re in orbit will be on board," NASA officials said in a statement. Other experiments and instruments returning on Dragon included: samples from a tissue regeneration and bone defect study, which studied how weightlessness affected the regrowth of lost bone and tissue from wounds; a prototype laser communications device for faster data transmission; a prototype for a space radiation proof computer for long space missions; and a robotic refueling technology experiment for in-space refueling and satellite servicing. This Dragon flight was SpaceX's tenth cargo delivery mission for NASA under a commercial cargo contract. SpaceX is also one of two companies (Boeing is the other) selected by NASA to fly astronauts to and from the space station. SpaceX is developing a crewed version of Dragon for those flights, while Boeing is building its own CST-100 Starliner crew capsule.